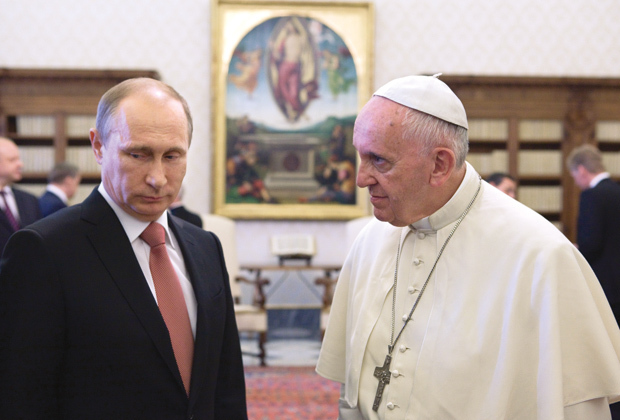 VATICAN CITY (CNS) — When Pope Francis met Russian President Vladimir Putin at the Vatican June 10, the ongoing crisis in eastern Ukraine was the principal topic of their conversation and was a concern for many others as well. Putin arrived at the Vatican more than an hour late, beating the 45-minute tardiness he chalked up in November 2013, the last time he visited the pope. Pope Francis and Putin spoke privately, aided by interpreters, for 50 minutes before the Russian president introduced the members of his entourage, including Foreign Minister Sergei Lavrov. “The meeting was dedicated principally to the conflict in Ukraine and to the situation in the Middle East,” said Jesuit Father Federico Lombardi, Vatican spokesman. “The Holy Father affirmed the need for a commitment to a sincere and serious effort to reach peace and there was agreement on the importance of restoring a climate of dialogue” and on adhering to the promises made in the cease-fire agreement, Father Lombardi said. The “serious humanitarian situation” in eastern Ukraine also was discussed, the spokesman said, as was the need to assure humanitarian workers have access to the region. In March 2014, Russia annexed the Crimea region of Ukraine and about a month later fighting began along Ukraine’s eastern border with Russia. Although Putin denied it, there were widespread reports that Russia not only was supporting separatists in the region, but that Russian troops had crossed into Ukraine. Hostilities reportedly have eased since an internationally mediated cease-fire agreement was signed in mid-February, but the fighting has not stopped. Exchanging gifts, Putin gave Pope Francis a cushion embroidered with gold thread; the design was of Moscow’s Cathedral of Christ the Savior, which Putin explained had been “destroyed in the Soviet era,” but has been rebuilt. Ken Hackett, U.S. ambassador the Holy See, was asked June 10 about the U.S. government’s view of the meeting. For the first time since 1998, the leaders of the world’s most industrialized countries — the so-called G-7 — held a summit in June 2014 and excluded the Russian president, citing the invasion of Crimea. They renewed their exclusion of Putin this year when the G-7 leaders met June 7-8 in Germany. “This is a very serious situation and I believe that the G-7 has pretty well decided that they are going to continue the sanctions because we have not seen the adherence to the Minsk agreements” for a cease-fire, Hackett said.